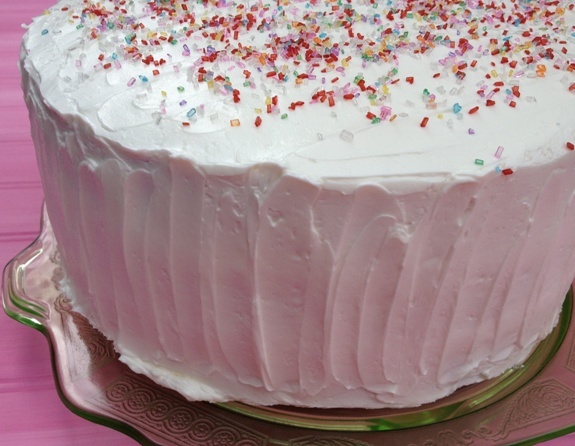 This is a very easy cake to make but the icing is a labor of love. I’d never made an Italian buttercream before. I was a little scared. I read a lot about them so I would know what to expect and decided to jump in. You have to be brave and patient to make this icing. At least the first time you make it. The cake, on the other hand, can be made in one bowl like a quick bread. It takes no time at all to mix together. I used a mixer but it’s really so simple it could be stirred together by hand in a large bowl. 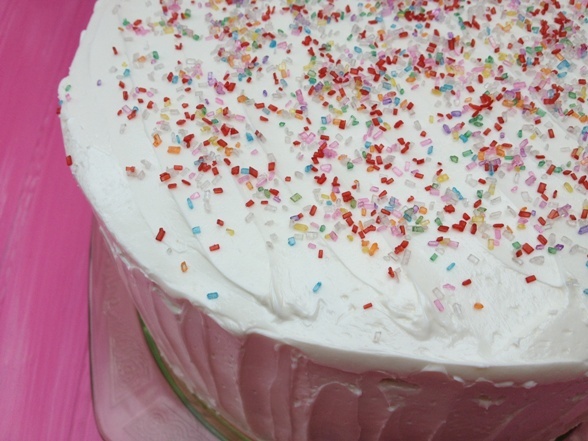 Italian buttercream is not as sweet as a standard sugary American type buttercream. 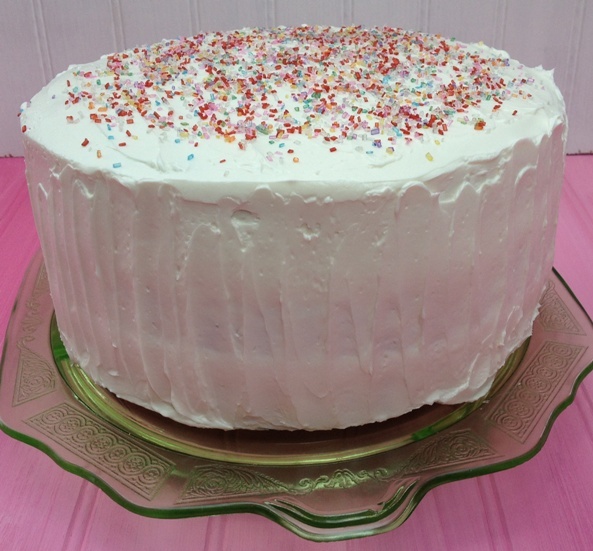 It is light and fluffy and easy to frost a cake with. It gets its body from a meringue base rather than powdered sugar. You should make this. It was so good. 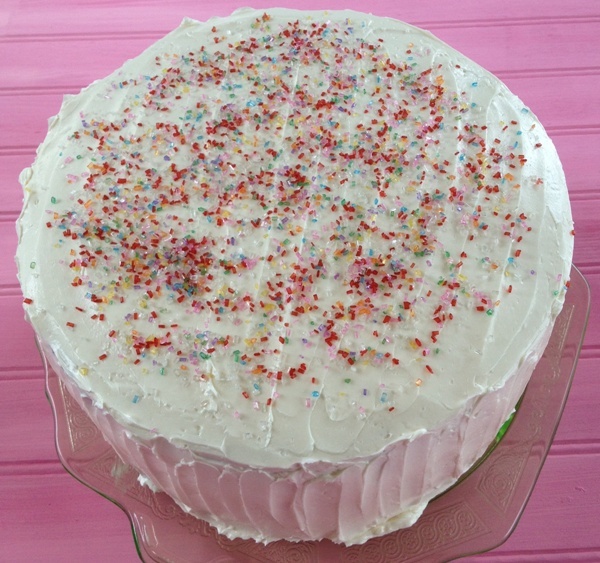 The icing is creamy and smooth and the cake is moist and fruity. I loved it! I know you can do it. You’re brave. When you decide to make Italian buttercream do yourself a favor and do a quick Google search to read a few recipes first. I mean read this one, but maybe read a few others. It really will help you get a handle on what to expect when you make it. It’s always good to read several other people’s accounts of making it. Everyone has a different tip or trick that could help you out. This is one of those baking projects I can really lose myself in and clear my head. I know I am not the only one who retreats to baking and cooking in times of stress or boredom or anxiety, etc. Not that I made this cake for those reasons. This was yet another birthday treat! Perfect for a very special birthday! While the sugar mixture heats, whip the egg whites and cream of tartar in the bowl of a stand mixer until fluffy and peaks form. Set aside until the sugar syrup is up to temperature. With the mixer running and whipping the egg whites, slowly drizzle the hot syrup into the whipped egg whites. Keep whipping the egg mixture until the bowl of the mixer feels cool to the touch. This will take a while. Be patient. It’s important it cools down. Once the mixture is cool, add the vanilla and begin adding the butter a pat at a time. It will start to look soupy and curdled. DON’T WORRY! Keep whipping! Keep adding the butter a little at a time. Keep whipping & whipping & whipping! Be mean to that buttercream! The buttercream will start to come together the more and more butter you add. Once you’ve added it all, keep whipping some more! It will take some time for it to come together into the fluffy delicious icing you are looking for. Be patient and be brave. Your time and effort will be rewarded. All this whipping is the reason I will only make this icing in a stand mixer. It does all the heavy work for you. Eventually you will have a light and fluffy buttercream. I put mine in a sealed bowl and left it out at room temperature over night until I had cool cake layers to ice the next day. I refrigerated the cake after it was iced only because it was a hot day and I didn’t want the cake to run. This could not be easier. Preheat the oven to 350 degrees. I stirred this up in one large bowl. In the bowl add the sugars, eggs, oil, banana, pineapple, coconut, vanilla, cinnamon, nutmeg and give it all a good stir. Add the flour, baking soda, baking powder & salt. Stir it all until combined. Pour the batter in even amounts into 3 lightly greased 9″ cake pans. I like my cakes in 3 layers. If you want 2 layer cake you can just increase the bake time a little. Bake at 350 degrees for 25-30 minutes or until a toothpick inserted in the center of the cake comes out clean. Allow to cool about 30 minutes and then remove from the pan and allow to cool completely before assembling the cake and frosting. I’ve been waiting for this post! Oh, how I’ve missed, you Hummingbird cake! and yes, the frosting is to die for. TO.DIE.FOR! And of course it’s a southern cake! Why do all the best cakes come from the South? Weird. You’d think we northerners would be inside baking to keep warm 9 months of of the year. We’re too busy shivering to think up delicious desserts! I don’t like bananas! Can I sub something ? That’s a tough one! You might be able to swap grated zucchini or mashed/pureed very ripe peaches perhaps. I can’t guarantee the result but it sounds good! I might have to try that cake with peaches! We love peaches! And strangely enough tim’s got a weird banana allergy. He can’t eat them raw but whatever causes the allergy goes away when baked so he can tolerate them in baked goods! Odd. If you try swapping out the banana let me know how it turns out! Now I’m curious! I was thinking about it and you could just increase the crushed pineapple to take the place of the banana. Or use mashed avocado! Or (depending on how you feel about this unorthodox flavor combination) what about pumpkin purée? Now you’ve got me thinking!